Take a look now and find half price bedding and textiles along with great reductions on garden and outdoor activities for kids. 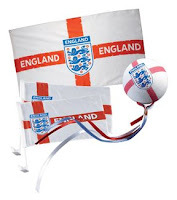 Plus, if you’re getting a bout of early World Cup fever, take a look at our great range of England merchandise – sure to get everyone excited about the footy! This England Car Set is only £5.99 and includes England car flag double pack, aerial topper and body flag.